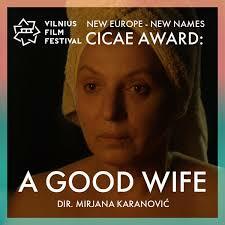 The Dutch premiere of the directorial debut “A Good Wife” by Mrs. Mirjana Karanovic, director and a famous Serbian actress will take place in De Balie Theater in Amsterdam (Kleine Gartmanplantsoen 10, 1017 RR Amsterdam) on 26 of October 2016 at 19,30 hours. Mirjana Karanović will be present at this exclusive Dutch première and the Q&A. ”A Good Wife” will also be screened in Het Huis in The Hague (Riviervismarkt 5, 2513 AM Den Haag) on 28 of October 2016 at 20,00 hours in the presence of Mr. Karanović. At 18.00 hours you are welcome in Het Nutshuis for a Masterclass acting of Mrs. Karanovic, dedicated to anyone who is interested in acting: students, amateur actors and professionals.